This vegan Parmesan cheese doesn’t melt like the real cheese, but it’s a great addition to many dishes. I usually sprinkle it on pizza, Caesar salad, add it to pesto or warm pasta dishes, use it as a topping for popcorn, or just about anything that needs a mild cheese flavor. When faced with the idea of switching to a plant-based diet, one of the main reasons people don’t want to do it is that they “can’t give up cheese”. It wasn’t my reason; I thought it was yogurt I couldn’t live without. However, there were a couple of cheeses that I knew were going to be hard to give up, like brie or Parmesan. When I was a teenager, I would eat an entire block of brie or heaps of Parmesan cheese in just one sitting. I loved the earthy smell, melt-y and stretchy texture, and salty flavor. So giving up cheese was definitely an adjustment. But it wasn’t just the taste of cheese that I missed. We’re all familiar with the “this reminds me of . . . ” experience of eating, when a particular food brings back pleasant memories. I make Alfredo sauce for my family not only because it’s delicious, but also because it’s something my mom made when I was growing up. So when I have cravings for cheese, I’m also having cravings for the people, places, and experiences that cheese just happened to be a part of. Fortunately, there’re lots of vegan cheese recipes out there to try out. Since Parmesan cheese was one of the cheeses I used to eat all the time (and also because my husband loves Parmesan sprinkled on just about everything), that’s the recipe I started out with first on a plant-based diet. Vegan Parmesan is made up mainly of cashews but you can use a blend of different nuts or seeds, such as pine nuts, Brazil nuts, and a little bit of hemp seeds. I like using cashews because their natural flavor mimics the nuttiness of real “Parm” perfectly. The “cheese” flavor comes from the nutritional yeast, a pinch of salt and a little bit of garlic powder. The garlic powder is optional but it adds a depth of flavor so I always add it in. 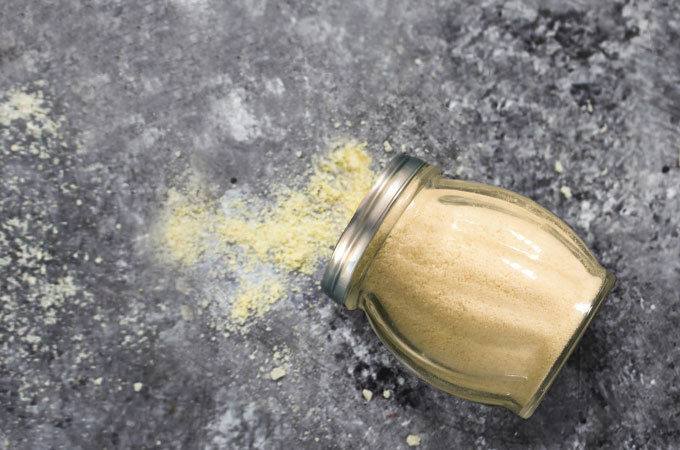 The easiest way to make this vegan Parmesan cheese is to use a food processor. If you don’t have one, you could also use a coffee grinder. It’s best to keep the vegan Parmesan cheese in a glass jar in the fridge so the cashews don’t turn rancid. This vegan Parmesan cheese is made out of cashews, nutritional yeast, garlic powder, and salt. It's cheesy, nutty, savory, and so easy to make. Add all the ingredients into a food processor and pulse until a coarse meal forms. Store leftover vegan "Parmesan" in an air-tight container in the refrigerator for 2-3 weeks. Love your Videos!! Really enjoy listening to your voice it’s so soothing! Thank you for sharing your wonderful recipes and Beautiful Smile! Aw, thank you so much for the kind words, Michael. It means more than you know! Where you get nutritional yeast? Hi Mona – I either buy it in a local bulk store or get it on Amazon. This is the brand I get: https://nutritionrefined.com/nutritional-yeast (please, note that it’s an affiliate link). Before making the above recipe, I wanted to know whether the cashews are soaked first. Thanks. Hi! I just got here through foodgawker . com. I am not vegetarian nor vegan but I like trying new things every now and then… and this was one of them. I made it yesterday and it was AMAZING!!! I got to put my cheese flavored nutritional yeast -which as a stand-alone ingredient for pasta, works good- to good use. Altogether combined (I used: granulated garlic, cheese flavored nutritional yeast., sea salt, black pepper and cashews) is fantastic. Thanks for an amazing blog. 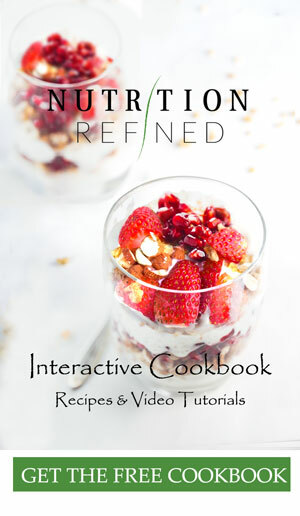 Love the recipes and videos. add the videos with for easy follow and enjoyment. and the input that Tanner gives. Always nice to have someones positive input. Allergic to yeast. Is there a substitute? I might have to use goat cheese. I have a food sensitivity to dairy. Hi Faye – unfortunately, I can’t think of a good substitute for nutritional yeast. The nutritional yeast is what gives the Parm its “cheesy” flavor. Sorry I couldn’t be more helpful. Discovered your channel yesterday on youtube and watched some videos…loved what ive seen so far. Im out of nutritional yeast so im on a mission now to get some and try out this recipe!! Will rate it once i try it. Thank you for the recipe. Can the cashew nuts be a little bit roasted before putting in a food processor. Thank you.